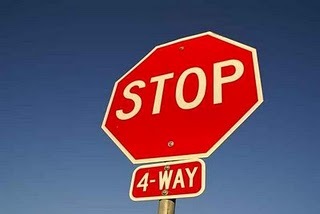 Growing up, I learned from my mother that 4-way stops were to be avoided at all cost. I think when I was about 13, the first one was introduced to my small town and the usual route to the mall became taboo because of that new 4-way stop. I asked mom why we didn’t go “the usual” way anymore and she explained that the new 4-way stop made it too difficult to figure out who had the right-of-way. She said if you went out-of-turn, it made people angry and life was stressful enough so best to avoid it altogether. Having no experience with driving at that time, I took what she said to be the gospel and got used to taking the “new” route to the mall. When I learned to drive a few years later at 16, I thought I’d test my mom’s theory – after all, I had gone through Driver’s Education and was the best driver in the world. The first few attempts were problem-free as I was the only driver at the stopping point. It wasn’t long though, before I could see what my mother was talking about. When more than one driver arrived at the stop, there were individual’s who went before they should have and those who sat and waited for everyone else to go first. This made it difficult for the rest to know when it was their turn. I saw fists shake, horns sound, engines rev and one person stopped in the middle of the 4-way intersection, got out of his car in protest at another’s expressed displeasure in his choice to go first. I had forgotten about this driving dilema until a colleague told her story the other day. She mentioned she came to a busy 4-way stop and wasn’t sure when it was her turn. Feeling pressured she touched the gas, proceeded and realized too late that she was out-of-turn. Aware of her mistake, she turned to the driver that she went ahead of and made eye contact. She slowly and distinctly mouthed the word “SORRY” as she continued, fully expecting to get the middle-finger salute. To her surprise, the driver very clearly mouthed back, “It’s OKAY”, smiled and waved her through. “So simple and insignificant” she said but it made her day. It made mine too. There can be civillity at the 4-way stop. If everyone could accept mistakes will happen and simply smile and wave as this gentleman did, maybe people like my mother wouldn’t have to find alternate routes to avoid stress. Very true! As an aside, I think this may be the same 4 way stop that my Aunt continued to barrel through as she claimed that it was only a two way stop before, therefore the same past rules applied. If you were at the corner that previously had no stop sign you had the right of way…as though everyone was to know the history of that particular corner!! You know it’s a small town when… 😉 Thanks for the smile!